Boots Conditioning Nail Polish Remover | There's nothing particularly exciting here... This did the job perfectly acceptably for me, I only really use it on my toenails as I can't wear nail polish for work. I'm not loyal in the slightest to nail polish remover, I just pick it up when I remember I need it. Repurchase? Maybe, but I wouldn't seek it out. ELF High Definition Powder | I still haven't really made up my mind whether I loved this or hated it, although I have now used it all either way. In theory it's great but in practice I felt it was somewhat lacking - it seemed to leave a white cast to my skin which I wasn't loving. I did think it made my skin look smoother in photos, but sadly not in real life. Also it had a weird silicon-y texture to it which I'm kind of undecided on, too. Repurchase? Maybe. I did really like it but I have a few day creams to use up, and somehow Yves Rocher isn't a brand I ever think to order from. Boots Botanics All Bright Cleansing Toner | This is my second bottle of this super-budget-friendly toner and I do still really like it; I do feel like it leaves my skin brighter and more even in tone when I use it regularly. That said, I think I may stray from it to try pastures new (read: something with a higher concentration of Glycolic Acid). Repurchase? Maybe, at some point down the line. Yardley Polaire Eau de Toilette | I won this ages ago in a giveaway and whilst it's not a scent I'd have chosen for myself and hasn't been one I've reached for daily, I have enjoyed wearing something a little different to my normal tastes. With notes including pear, freesia, rose, ginger, pink pepper, patchouli and amber, this is very much a floral fragrance to my nose. Kind Natured Volumising Rosemary & Mint Shampoo | I enjoyed my first foray into Kind Natured products; I've been using this shampoo after I've been to the gym and have found that it works well to clean and refresh my hair, with a lovely scent and a nice formula. I usually go for volumising shampoos as they seem to work best with my oily roots, and I have to say this was one of the better shampoos I've tried in terms of keeping my hair looking fresh for longer. Repurchase? Maybe; it's a nice range, and reasonably priced. Boots Botanics Shine Away Invigorating Face Scrub | This is a lovely budget-friendly exfoliator which I tend to use in the shower after I've been to the gym; a gel base with exfoliating particles that aren't too harsh on the skin, I'd say I've been using this two or three times per week. It works well to smooth out any dry or rough areas of skin without causing irritation or soreness, and although I can't say I've noticed any mattifying effect from using it, I wasn't really expecting to and don't really mind! Rimmel Match Perfection Silky Loose Face Powder | Yeah that's right, I've finished off two powders this month! I quite liked this Rimmel number actually, it didn't oxidise on my skin and seemed to work pretty well at setting my foundation, although I'd prefer something that kept me a little more matte. Still, you can't have everything in life! Soap & Glory Sugar Crush Body Butter | This may have been picked up as a "one for me" purchase whilst Christmas shopping... Well, with 3 for 2 on Boots gift sets, it would have been rude not to, wouldn't it!? I love the Sugar Crush fragrance - sweet and citrussy, it's exactly my cup of tea, and this mini body butter didn't last me long at all as I used it basically daily after going to the gym. Bourjois Happy Light Matte Serum Primer | Oh boy, am I glad to see the back of this one! I've been trying to use it up for months and it's seemed never-ending. Maybe because the pump broke? Anyway, I hated it. It smelt like rubbing vodka on my face (oh, hello, Alcohol Denat. in the ingredients list), made my foundation go on funny, and didn't even have the good grace to keep my skin matte after all that. A crashing disappointment here! COLAB Rio Dry Shampoo | Ah COLAB; my new dry shampoo love! This has well and truly replaced Batiste as my go-to dry shampoo choice, although unfortunately it's not quite as widely available, so I do end up picking up Batiste in the supermarket in desperate times. I love Rio's tropical scent and find that it works well for me to absorb excess oil at my roots on second-day hair, without the horrible white cast that some dry shampoos leave. 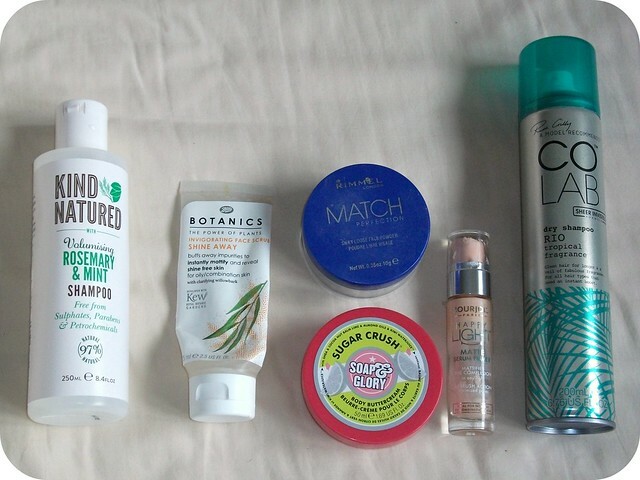 So January hasn't been a bad month in terms of clearing out my mountain of beauty products!! Have you tried any of these? Aren't empties just SO satisfying?? yay so many empties!! I love to read these posts! great to hear about the yves rocher cream!! I've been thinking of buying the eye cream from that line! I love reading through everyone's empties!! The Boots botanics face scrub sounds very interesting. 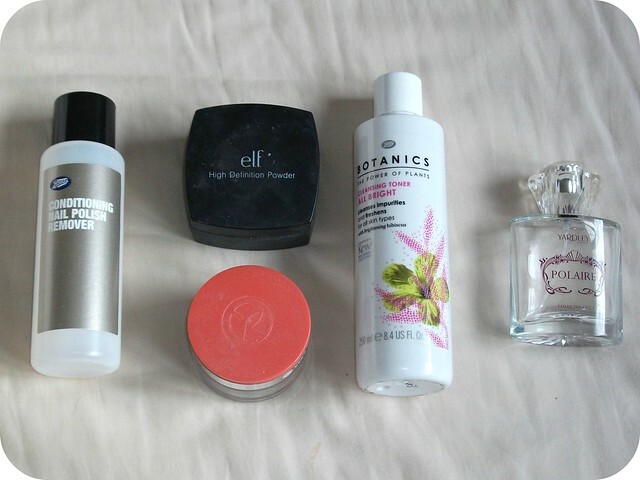 I love reading empties posts! I love Soap and Glory so much. I want to try the body butter you used up! 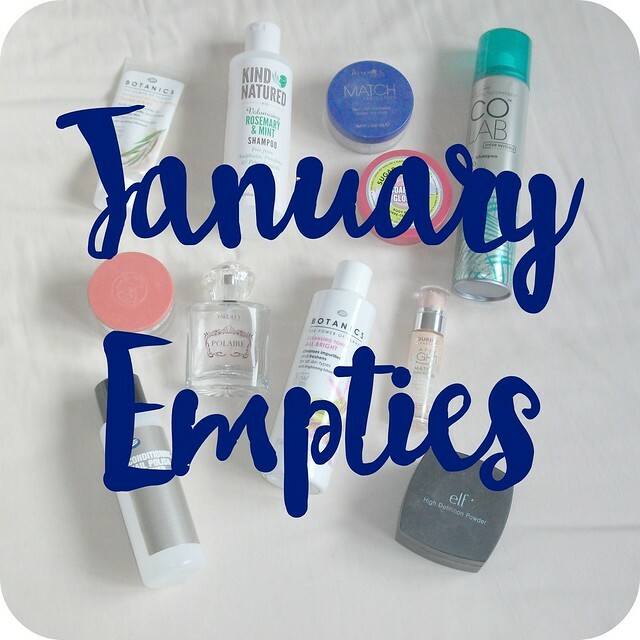 I love empties posts and your photos look great! That Rosemary and Mint shampoo sounds right up my alley. I bet it smells amazing. I've fallen head over heels fro Colab as well - it's such a gooden!! !